Is there a thing as too much sink/load in the back hip? I was looking at my kid's swing from a tournament over the weekend. Does it look like he might be sinking in that back hip too much? I know there are other things in the swing that he could work on but my question for now is the back hip load/sink. In all my days on Earth, I have never seen a person coil too much. What he should be doing is simple: coil his shoulder and hip inward AS he goes forward. What he seems to be doing is coiling inward over his back foot, before he has any forward motion (the stride forward). So his stride is basically coil OUT AS he goes forward. (His coil in is wasted. Get him to coil AS he goes forward. Get him to do it front of a mirror EVERY night for a few days until he gets it. This is THE MOST important thing he can learn. Yeah, I didn't mean it as too much in the way you might have took it. I just wondered if he sinks too much, therefore changing his eye level. We work on the inward coil. As with most youngsters he does it good in dry swings or tee work but live hitting, nope. It's a work in progress for sure. Is there a thing as too much sink/load in the back hip? Absolutely, it's a common flaw with kids who have been instructed and overdo it to the point of imbalance, etc.. Your son though, does a pretty good job of being able to get off of his back foot to the point where he gets his back foot vertical and he might even shift completely off of it into his front leg. So if he's over doing it it might just be a little if any at all. But he's pretty busy with the other stuff. I'd rather see the batter maintain their height throughout the swing. Less eye movement = better tracking of the ball and better balance. It's something he can get away with now but can become a problem as he faces better pitching. Thanks for the comments guys. Yeah, he has some flaws for sure. Just trying to work at his pace and not try to over fix it if that makes sense, since he is still 8. He will be 9 next year. His load needs some work imo. His hands don't really move at that much, just his elbow moving up pushing his hands down which prevents him from getting in a good strong lunch position. He needs to maintain that coil forward as Song said above because right now he is uncoiling during his stride which causes him to open a little early. Probably the reason he mashes middle in but struggles with outside. He has a little too much head movement for my liking, but he has been successful so far with it. We do talk about it though and he understands. It' a work in progress. 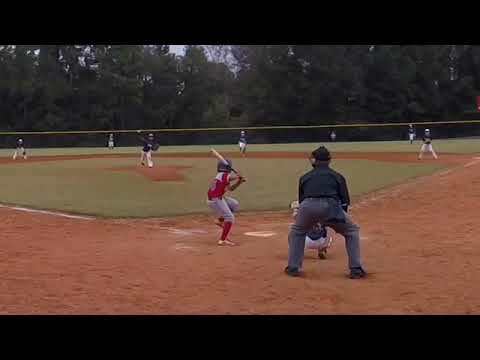 Living in GA he faces some of the best 9U pitching there is. I would prefer him to stay a little taller on that backside to not have his eye level drop so far down. I'm sure there are other things that can be picked apart. If I see something that just looks different to me, like the big sink in the back hip, I usually come to you guys so see what you all think. I've been here since he was 6 so all of you have been his hitting instructor, and mine, for the last 2 years. Here are some clips from last month where he seems to stay taller on his back side while still loading in the back hip, so the big sink is something that has just started for some reason over the last month. His load is also better. His hands move back. The elbow does not move up like he is doing a chicken wing load. These are things that have just started to show up. Nothing has change as far as instruction. I'm not one to do all these crazy drills either. We start of with tee work. We do the walk in, work outside, middle and inside. Then front toss then BP. We try to simulate game like situations the best we can. The first one he hit it off the fence 220 feet. I thought he had has first KP over the fence HR. Even heard a parent in the background of the video say, "That's over!". All comments are welcomed and appreciated. Thanks for everyone's guidance over the last 2 years. I wish you guys could come see him in person cause I'm serious when I say you all have played a big part in his early development. Last edited by coachrjb; 11-06-2018, 05:30 AM. i'm with song. Work on the load/coil. the sequencing is off which is why you see him sitting, fully loaded at that position and then uncoiling as he goes forward. It's hard to sit/sink like that if you are coiling as you stride out. He's 9 so understandably, it's a work in progress. Great power and energy! Keep it up! Still a work in progress but he is determined and working to get it. Thanks! Nice coil-in as he goes forward. Bravo. Your son is obviously coachable and doing his best to try to do what you want. A question. What does he feel on his back side? I want my hitters to feel a sense of tension on the inside part of the back thigh during the load and "sit" portion of the swing. (Some might say this tension tends to make it feel like the back knee is wanting to rotate a little toward the catcher but is stopped.) I don't what a feeling that they are going back over the back knee. If they can get this feeling, understand how to ride it, and control the uncoil, they can sit on off speed pitches while being able to fire on the fast stuff. I really like a lot of what your son has done but I've said that before. I would have like to see the hands staying back as the hitter coils forward. I would like the hitter to continue the pull back on the scap/'loading' the rear leg. See the hands go forward with/as the body goes forward. Walk away/coil from the hands......To me that would be FBC. Separation is where the power comes from. That's the 'missing frames' so to speak. Again JMHO. Last edited by rdbass; 11-15-2018, 05:38 PM. RD, for me, I thought that the pitch was pretty far inside. Get video work. Another 'flaw' I didn't want to bring up the hitter is swinging 'around' the ball/body and not 'out from' the body. Might as well throw in shifting THEN swinging. Again JMHO and take as just a dad with a DD. This gif wasn't posted to show the above 'flaws'. See above posted gifs in earlier post. Posted to show what I thought was a down the middle pitch. Last edited by rdbass; 11-15-2018, 05:35 PM.